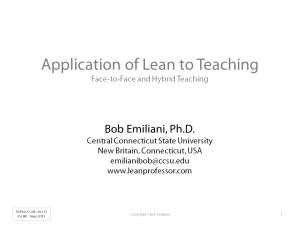 The title of my keynote talk was: “Application of Lean to Teaching.” I discussed how I developed and applied the Lean teaching pedagogy over the last 15-plus years. In addition, I presented my new approach to course design aimed at transforming face-to-face and hybrid teaching from “push” to “pull. Click on the image below to view my presentation. I also led a workshop titled: “Lean Leadership for Higher Education,” which presented how university leaders should begin a Lean transformation and gain broad-based buy-in. Both were very well received. I bought the book “Lean Teaching”, and now have these presentations. I am so excited to learn how to be a better professor. Great stuff! Excellent! I’m sure you will love the book. Let me know how things go as you move forward to improve you courses. The educational/learning process or system in play throughout most of the US is something of great interest (and concern) to me. I read your article with the hope that there might be some content that addresses much of what’s currently wrong or deficient or in error with regard to the prevailing educational/learning process. In that regard, the notion of creating more of pull-based learning system has some appeal. What strikes me as being potentially problematic to creating and operating such a system is the degree to which each individual course attendee might be aware of or sufficiently knowledgeable of the subject matter would seem to be a potentially limiting factor in being able to ask for or express greater interest in any particular aspect(s) of the subject matter being offered. Thank you for your comment. I do understand your concern. Others have expressed it to me as well. That is why, at the present time, I do this for my graduate courses only, not my undergraduate courses. While many are not very knowledgeable of the subject matter, my experience to-date is that they do possess the ability to identify basic things that they want to get out of the course, and will then focus their efforts on obtaining that learning. It can vary widely from student-to-student. Still, it seems to work quite well, but I am always looking for ways to improve. It’s constant trial-and-error. Makes some sense at the graduate level, particularly for those who have some exposure to the subject matter being focused on within the course. Yet, if that prior exposure was to a “traditional” body of knowledge and associated thinking and behaving patterns, what students might think/believe they want out of course may NOT be in line with the actual intent of the course (i.e., introducing a NEW and BETTER way of THINKING AND BEHAVING). Ergo, critical to the up-front or pre-course inquiry process would be a statement of “INTENT” that orients the students to what the primary purpose of the course happens to be. In that regard, what might be emphasized – in addition to the targeted content – would be what content is OUT-OF-BOUNDS or CONTRADICTORY TO THE INTENT. In fact, what might be a good addition to the pre-course inquiry/feedback process would be providing the students with a brief and insightful primer (as reading material) containing one or more real-world examples of where and how and why the content of the course is being put to use in the most value-adding manner possible. Ergo, any additional or customized content of interest to any student should be in line with the point/points that the primer material is making. Even those who do not have exposure to the subject matter are able to determine what they want to get out of the course. How? In the first three weeks of the course they go over some of the material. From that they gain a good sense of what information they want to pull from the course. Any exposure to traditional knowledge is challenged at the start using the materials that I give them to study.